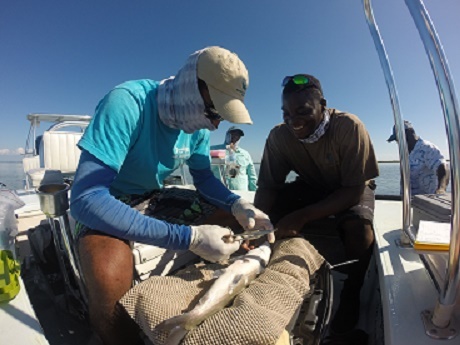 In October 2014, the Flats Ecology and Conservation Program visited Grand Bahama Island to set out an array of acoustic receivers to track bonefish movements during their spawning season. This was part of an effort to determine aggregation sites and spawning areas. 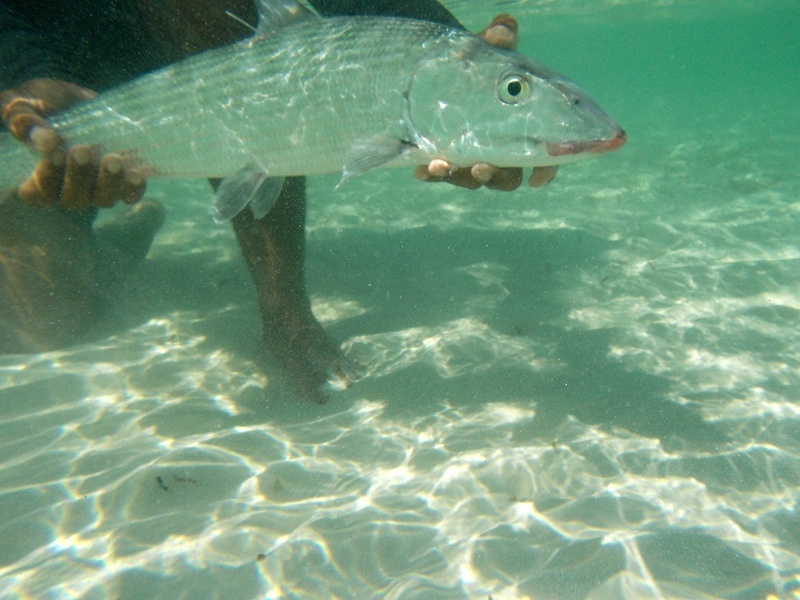 A healthy bonefish being released after surgery. In December 2014, the project received a substantial equipment grant from the Ocean Tracking Network (OTN), providing an extra 32 receivers for the study array. The team, consisting of CEIS board member Dr. Dave Philipp, College of the Bahamas professor Dr. Karen Murchie, CEI Research Assistant Eric Schneider and Bonefish and Tarpon Trust’s (BTT) Bahamas Initiative Coordinator, Justin Lewis, downloaded the initial array in January 2015 to determine where the additional receivers should be deployed based on preliminary data. Out of the 56 fish tagged in October 2014, 19 had been detected in the array. Movements to date included use of the Grand Lucayan Waterway, along with at least two key areas that appear to be aggregation sites on the south side of Grand Bahama. Movements to the aggregation sites typically occurred during moon phases during which spawning events normally occur. 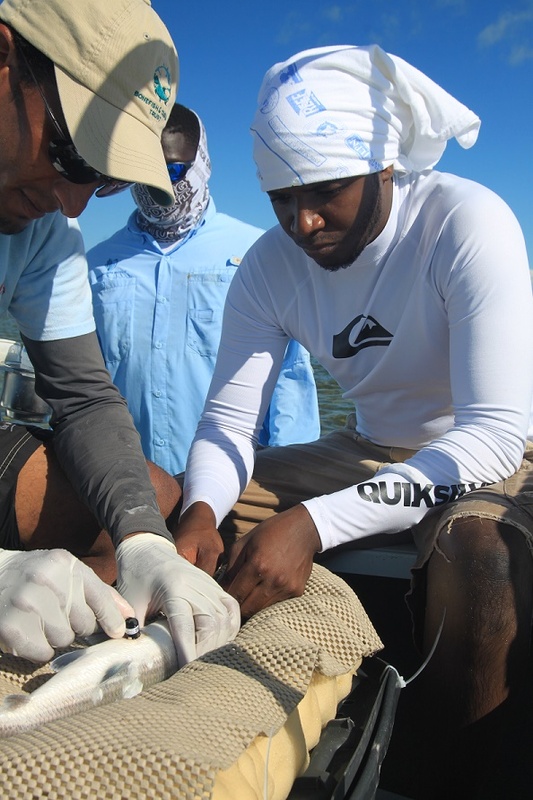 Justin Lewis (BTT) and Frederick Arnett (Department of Marine Resources – DMR) inserts an acoustic transmitter into a bonefish in October, 2014. The team deployed the 32 receivers on loan from the OTN, as well as an additional 3 receivers provided by Aaron Adams of BTT. The extra equipment combined with the original array means we now have very extensive coverage of the south side of Grand Bahama all the way from the very west end, and down along the various cays on the east end. A complete download of the array will occur in June 2015. Updates on the project findings will occur subsequently. The team is grateful for the support of the OTN. 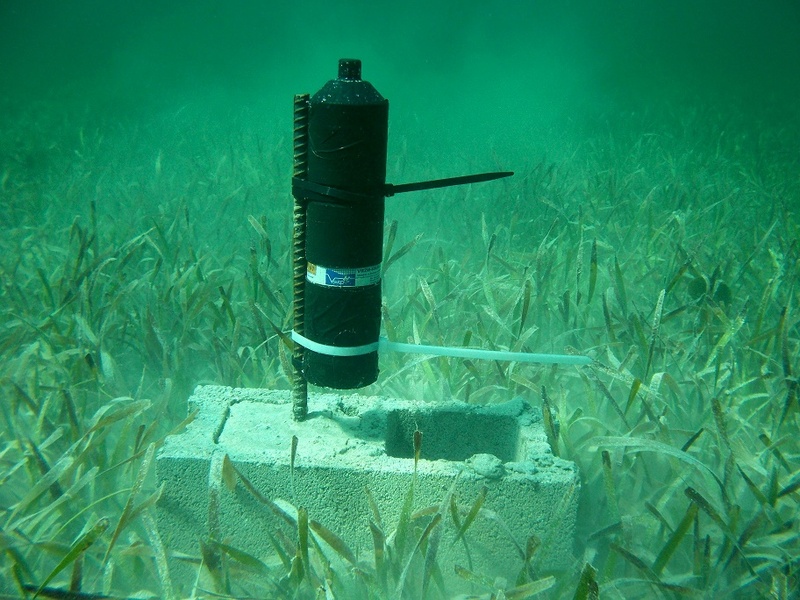 Not only does our array of receivers allow us to monitor bonefish movement, but additionally, any other VEMCO transmitter-implanted fish can be detected. In fact, 3 tiger sharks tagged off of Tiger Beach by the University of Miami have been detected at 3 receivers within our array! An acoustic receiver positioned on a seagrass bed in the Grand Lucayan Waterway on Grand Bahama. This information has been shared with the researchers and they are also excited about gaining additional information that they would not have had if it weren’t for our monitoring around Grand Bahama. Continued logistical support by h2obonefishing and North Riding Point Club has also been greatly appreciated.